Kauai is one of our favorite places to vacation, and it’s a place we love to return to over and over again. While many think of Kauai as an only romantic destination for honeymooners or outdoor adventure enthusiasts, there are lots of things to do in Kauai with kids. We’ve visited Kauai many times with my little boy and are preparing to head back there in a few weeks for my birthday trip over our winter break. As I prepare for our upcoming trip I’ve decided to update my list of favorites here too. These are some of our favorite spots. 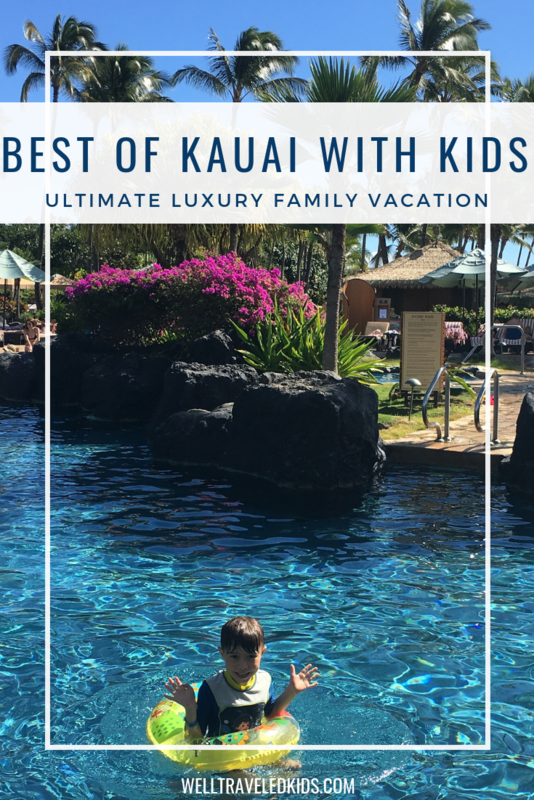 I hope you find this list of our best tips helpful for planning your own Kauai family vacation. 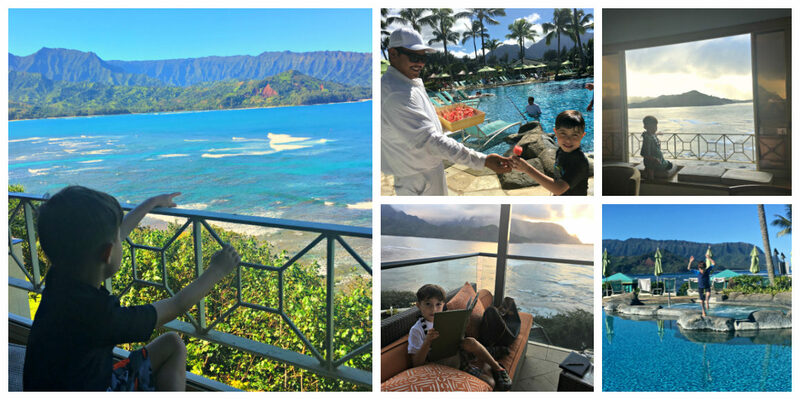 Our absolute favorite place to stay in Kauai has always been the St. Regis Princeville Resort Kauai. However, that resort recently changed hands a few months ago and is now newly branded the Princeville Resort Kauai. I’m headed back in a few weeks and excited to see what’s new there! Located on Hanalei Bay, it’s easily one of the most breathtaking resorts I’ve ever visited. The grounds of the Princeville Resort are lush, relaxing and rejuvenating. While we love to explore the sights of Kauai, it’s hard to motivate ourselves to leave the stunning resort when we visit. I can’t begin to describe the amazing energy at the Princeville Resort. Between the Hanalei Beach, and the pools, and the spa, it’s an incredibly indulgent experience. In fact, I’ve chosen to spend three of my last four birthdays at the Princeville Resort and will be there this year for my birthday too! I can’t wait!! 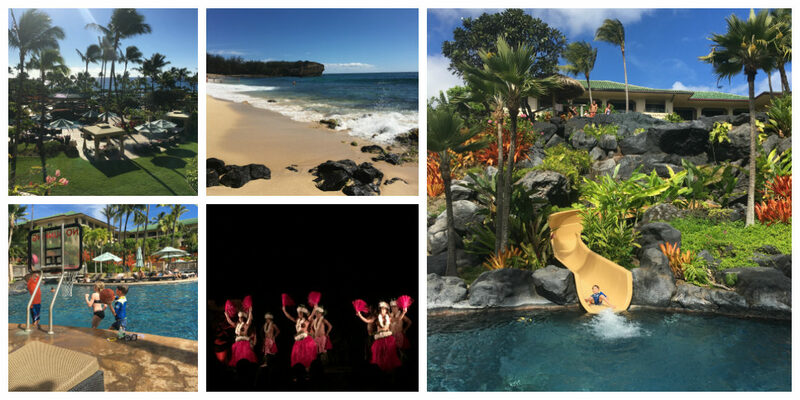 We also love the Grand Hyatt Kauai Resort & Spa, and it’s one of the best Hawaiian resorts for families. The Grand Hyatt is truly built for families. The pool area is perfect for parents and kids, with slides, basketball hoops and shaved ice treats. Our room was very large with two king beds, giving us room to spread out a bit. The Grand Hyatt Kauai also has the best luau in Kauai. People from all over the island come to this one, for the family entertainment, great luau food and excellent MaiTais. Make sure to reserve your spots in advance! Be sure to plan some self-care time for yourself and book an incredible treatment at the spa while your kids make friends and play at the kids club during your stay. The Princeville Resort is on the northern side of Kauai on Hanalei Bay, while the Grand Hyatt Kauai is on the southern shore near Waimea Canyon. We like to split our time between the two resorts when we visit Kauai so we can more easily explore all areas of the island. There are some amazing places to eat in Kauai, from food trucks to five-star dining. 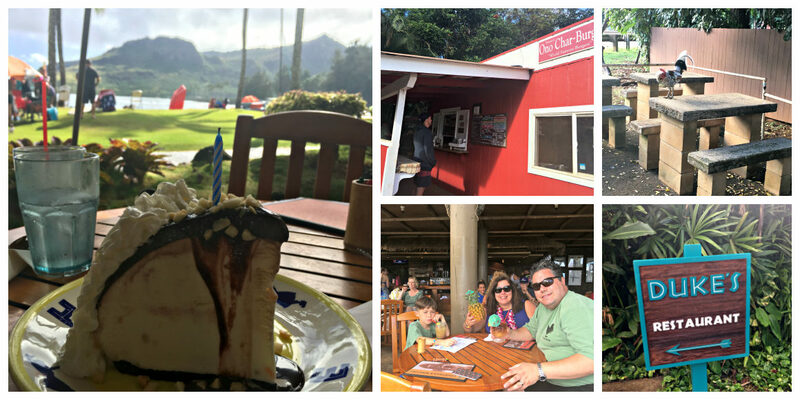 We love to visit old favorites, but also like to try new places every time we return to Kauai. These are some of our top suggestions for where to eat in Kauai. Check back, because I’m sure I will be adding additional restaurants soon when we return from our upcoming Kauai vacation! For a romantic dinner in Kauai, we love the Kauai Grill. The Kauai Grill is a fine dining experience on Kauai that’s definitely worth the splurge! In addition to amazing food, you have breathtaking views of Hanalei Bay. While kids are allowed, you won’t see too many of them. I recommend bringing an iPad and headphones to keep them from getting antsy during dinner. This is our pick for the best fresh seafood in Kauai is Merriman’s Fish House Kauai. Everything here is “ocean to table.” While it’s a fancier restaurant, they do welcome kids and offer a kid’s menu. Our whole family loves the Ahi Ginger Poke and the Wok Charred Ahi is sensational!! Duke’s Kauai is a fun casual spot that sit’s right off the beach not too far from the airport. We like to grab lunch in the barefoot bar right off the beach. Duke’s bartenders make incredible Mai Tais served in fresh pineapples. The menu is casual and I’ve always loved the coconut shrimp appetizer and the fish tacos. Duke’s Hula Pie is a Hawaii tradition and our favorite dessert in Kauai. Starting with an Oreo crust, followed by ice cream, macadamia nuts, and hot fudge, you’ve never had a pie like this! Whether you have lunch or dinner at Duke’s or just pop in for dessert, make sure you have Hula Pie at least once during your Kauai vacation. Hands down the best roadside burger in Hawaii. It’s on the main road, so it makes for a great stop when traveling to or from the Kauai airport. Just look for the red burger shack on the side of the road. This place is a total dive, but the burgers, shakes, and fries are to die for. We’ve stopped here at least three times and tried several items – we’ve never been disappointed. The feral chickens begging for French Fries are hilarious and your kids will get a kick out of feeding them. Your Kauai family vacation should be the right mixture of relaxation and exploration. These are some of our favorite things to do in Kauai when we can tear ourselves away from the amazing resorts. Waimea Canyon: The “Grand Canyon of the Pacific” is ten miles long up to 3,000 feet deep. You can see all the way to the Na Pali Coast. Hanalei Bay: This is the largest bay on the north shore of Kauai, with over two miles of beach. The protected bay is a great spot for water sports like swimming and stand up paddleboarding. Spouting Horn Blowhole: One of Kauai’s best natural attractions. Just ten minutes from the Grand Hyatt Kauai in a spot known for crashing waves. Driving around and exploring the island! Between our Kauai adventures and the long trip from Chicago, I always like to take a day to relax at the spa during my Kauai vacation. I’ve tried the spas at both hotels mentioned above and while they are very different experiences, I highly recommend at a day at either one. Anara Spa at Grand Hyatt Kauai: The Anara Spa at Grand Hyatt Kauai is huge, with a huge focus on the outdoors. There are outdoor showers, hot tubs, and massage huts. 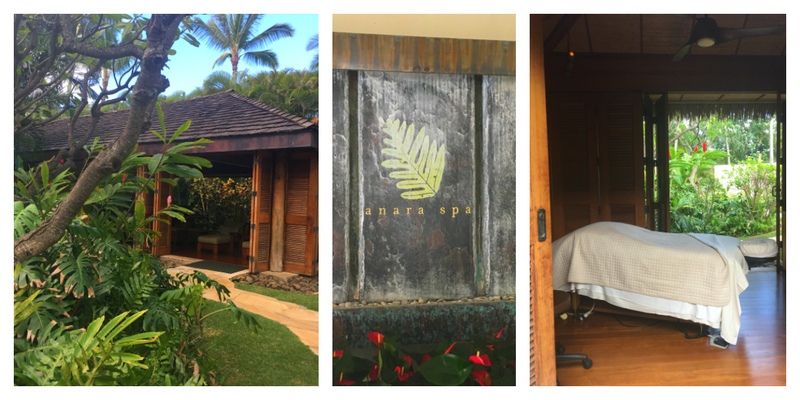 The Anara Spa is a really lush outdoor Hawaiian spa experience. The Halele’a Spa at Princeville Resort: compared to the Hyatt, the Halele’a Spa is more of an indoor retreat with an intimate atmosphere. The entire spa and locker rooms are beautifully decorated. For a super zen spa experience, head to the Halele’a Spa. I think it’s impossible to take a bad photo in Kauai. With stunning scenery in every direction, don’t forget your camera! 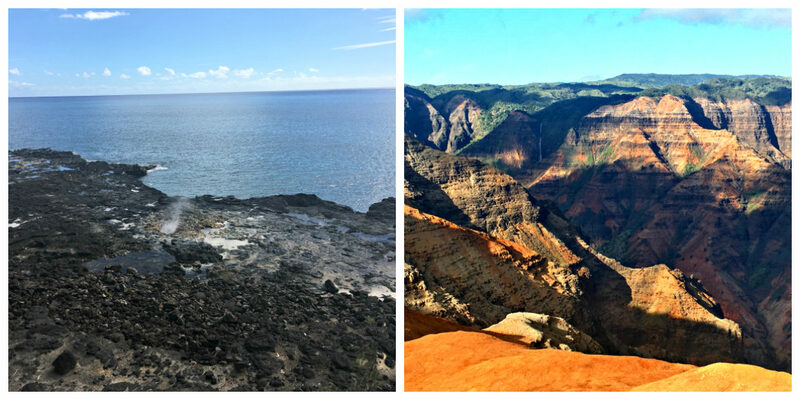 Here’s some of our favorite photo opps in Kauai. Anything that includes chickens! Feral chickens are quintessential Kauai, so don’t miss the chance to photograph a few. 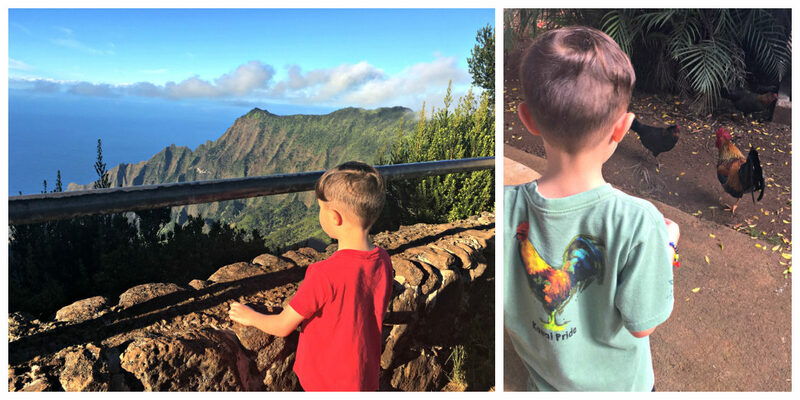 Ready to plan your trip to Kauai with kids? Here are a few more tips to help you prepare! Rent a car. Everything you want to see in Kauai is far from the airport. If you don’t rent a car, you’ll likely end up spending a lot of money on cabs and Ubers. With a car, you can explore the island at your own pace. Stop to buy groceries and snacks. Before you leave the airport area, stop at Wal-Mart or Costco to stock up on snacks and water. Your room will most likely have a fridge, and you can save a ton of money on basic food and sundries. These are also great places to buy souvenirs before you fly home. Make high season reservations ASAP. If you’re traveling anytime kids are out of school, especially during Christmas or Spring Break, make your hotel reservations ASAP. Once that’s done, you’ll want to start making dinner reservations if there are specific restaurants you want to visit. Decide on excursions and book them early. The same thing goes for excursions. Tours can fill up quickly on the island, so if you plan to do any ziplining, snorkeling or boat tours, make sure you book them in advance.